Much has been written about the psychology of giving, the reasons why we donate to charity and the different triggers that spark acts of generosity, some rational, others visceral. I am particularly fascinated by the impulses that lead us to give money to people begging on the street. In fact, to be candid, I am frequently left incredulous at the justification given for dropping money into that cap next to the sign that says ‘hungry and homeless’. Research indicates that for 90 per cent of people who give, compassion is the motivating factor. So I should not have been surprised that when speaking on BBC radio last week on the subject of begging, the first question was ‘isn’t it counter-intuitive that a homelessness charity is urging us not to give to beggars’? There he is, the homeless man cross-legged beside the cash point, beseeching, grimy, desperate. Do the right thing. A few years ago, one such man attracted the attention of Grant Shapps, then the shadow housing minister, when he accompanied us on an outreach shift. We appreciated Mr Shapps’ willingness to brave the wet and windy weather that night and by 11.30pm he was confidently approaching homeless people, looking every inch the outreach worker. After speaking at length to the man by the cash point he returned wearing a pensive expression. The story was this. The man was living in a bed and breakfast in central London and was on a methadone ‘script’ as part of a planned withdrawal from heroin. But he was going through a bad patch and had come to the cash point, well-known for being a lucrative pitch, to beg in order to ‘top up with heroin’. The shadow housing minister concluded that on the streets ‘things are not always as they first seem’. Indeed they are not, especially when it comes to begging. It is now 10 years since Thames Reach and other like-minded homelessness charities first sought to persuade the public not to give money to people begging on the street. Over the ensuing period, numerous campaigns have been undertaken to drive home this message in towns and cities across the country. The reason why such campaigns are considered necessary is because of the incontrovertible evidence that the vast majority of people begging on the streets are doing so in order to purchase hard drugs, like heroin and crack cocaine. Naturally the street outreach teams are well aware of this. It is also regularly confirmed by the police following operations to arrest persistent beggars when, consistently, at least 70 per cent test positive for hard drugs. Usually the majority of those arrested are not sleeping rough but in some form of accommodation. There are those who contend that the recession is bringing a new kind of beggar onto the street, a person not addicted to hard drugs but simply in need of food. I am unconvinced. Data from a recent police-led operation in Birmingham that took place from August to October this year shows nothing has changed. In total 28 arrests were made for persistent begging. Six out of 10 of the arrested had their own home and all tested positive for drugs. To understand the complexity of the relationship between the recipient and the giver, nothing is more illuminating than speaking with those who have systematically begged as a desperate vocation. Cheryl begged every day for five years around London’s Charing Cross train station. She had habitual givers who knew her well and through their contribution was able to sustain a ferociously destructive heroin habit before a social worker, after yet another hospital admission, found her a hostel, from where she embarked on a treatment programme. In Cheryl’s opinion, women are the most successful beggars because of their perceived vulnerability and, reflecting on her begging years, she was aware that, perversely, the more ill she looked, the greater grew her begging returns. I was particularly interested to know how the interaction with her regular contributors played out. After seeing her on the streets for months, sometimes in conversation with outreach workers, they must have been aware that her problem was more than needing somewhere to live. Cheryl’s assessment was that they undoubtedly knew that she had a big drug problem but as long as it wasn’t mentioned, all parties could agreeably go about their business and nobody was left feeling bad. So, in the manner in which it is rather vulgar to ask a fellow guest about the value of their house at a dinner party, certain things were left unstated lest the warm glow of giving be uncomfortably dimmed. Some people don’t need this charade. They are sanguine about their spare change being spent on drugs. ‘Because I feel sorry for them’ is a common justification. At which point a hot wave of anger will sometimes wash over me and my mind shifts to the front line staff, the people invariably left to try to pick up the pieces in the face of such complacency. To the hostel workers who earlier this year were unsuccessful in their valiant attempts to revive a young woman who took heroin bought largely with money begged in the early hours from the good people emerging from clubs and shortly after drowned in her bath. So we will battle on, supporting people to enter rehab, complete treatment programmes and deal with the complex underlying issues that have led them into dependency, all the while rowing hard against the seemingly unstoppable tide of public generosity. Hello, very interesting article and I had suspected that giving in a more systematic Manor was more effective at combating the problem. However I as wondering if you could put some links up to the evidence you have quoted as I think it would make interesting reading. Interesting and this is why I no longer give to beggars. It would only support the behavior and prevent these people from actually bettering themselves. Hello, welfare class. has done a lot of work on measuring outcomes to help people eager to support charities to assess how their money will be spent and the impact it could make. I'm impressed with what they do but suspect that many people still make a donation based on an emotional impulse. To some extent one can say - well so what? - but in the case of giving money to a person begging there is a very dark downside to the giving and I don't believe it can be seen as act without consequences. Hi - glad you are convinced! It may be a different scenario elsewhere, for example, in Lagos people may well be begging in order to get food and to keep themselves alive. I wouldn't want to have a view about the situation there as that is not where Thames Reach's knowledge and expertise lies. We can only give you the facts about the situation in the UK. I'm convinced by your arguments and I do give money to organised charities which I think can help people. I still feel a bit guilty when I walk by people begging though. I'd like to be able to give them advice about local places to get food, shelter and help. Do you know where I could find that information? 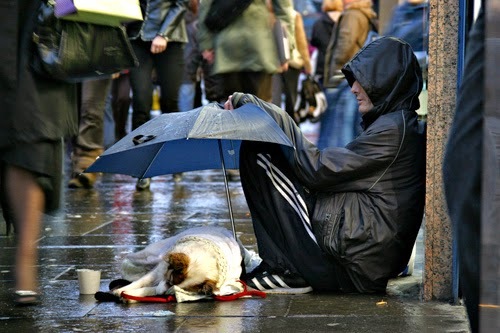 In your work with people on the streets, how aware do you find them to be of help they can get? Thanks for your thought-provoking piece. Hi Jeremy, Loving your pictures and the simple and beautiful way you have put your story across - you're an inspiration and I am following your journey - awesome work! I don't see much logic in your arguments. Your main point seems to be the proven link between begging and drug use, but beyond establishing this you fail to explain why beggars spending the money they get on drugs is actually a bad thing. You rely on the assumption that it is, by definition. I don't think that is true. Addicts don't kick their addiction because they've run out of money. The kick when, and only when, the desire to be clean, to start again, becomes stronger than the need for a fix. You cant simulate it by making them more skint. Withdrawal makes people desperate, and desperate people do stupid things. They steal, get arrested, trap themselves in a closed world of criminality and institutionalisation. All the while, the possibility of getting out, of summoning up that desire, diminishes. And on my part, I refuse to think suspiciously about every beggar I see. I don't want to cultivate that kind of cynical, detached paranoia any more than I can help. So I assume on principle that every beggar is exactly what they seem, not because I believe it, but because I don't care. I'd rather give money to 10 people even if 9 of them spent it on drugs, because it is just possible that that other 1 person really, really needed it. Thanks for your comment. The reason that, at Thames Reach, we think that giving money to people who beg is a bad thing is because of the proven link between the giving, misuse of crack cocaine and heroin and death through drug misuse. The most recent tragedy that has rocked us is the death of a man we knew well who was found dead at his begging pitch outside a south London railway station. He had pneumonia and had discharged himself from hospital in order to beg to get money to buy heroin. Our teams work with many people who are in the process of reducing and, hopefully, ending their use of hard drugs and our objective is to help them through the incredibly challenging process of addressing a serious addiction. The easy availability of money through begging is a major hindrance to people at the point when they are reducing their dependency so our experience means that we do not agree with your view that giving money plays no part as to whether someone stops using drugs, or not. Of course, helping people to end a dependency on hard drugs usually requires a package of support that needs to be delivered professionally and sensitively and we manage a number of drug treatment projects that work with people as they reduce their use. But the easy pickings on offer through begging works against us in a very damaging way. Unfortunately many of the people we work with who are begging and using hard drugs are also involved in low level crime, so it is rarely a matter of committing crime because the begging opportunities are reducing; both are an element of a destructive life-style we are supporting the person to move away from. I am sorry that you think our approach reflects a cynical, detached paranoia. All I can say is that, having been on the street many times with colleagues working tirelessly through the night to help people off the streets and away from homelessness, they seem to me to be some of the least cynical, most engaged and determinedly clear-eyed people I have ever had the privilege of working with.